The Association of British and Irish Accountants a.s.b.l. (ABIAL) held its AGM on Thursday 2 July 2015 at the Golf Club Grand-Ducal. The event was attended by 33 members and guests of ABIAL which represents accountants of five UK accountancy bodies in Luxembourg and has over 600 members. As each year, the Association awards top performing students of the accountancy bodies in Luxembourg. In 2014 only ACCA students graduated in Luxembourg. 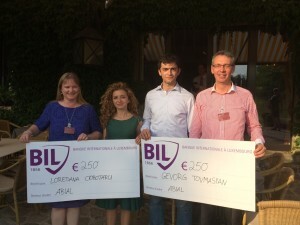 Their top three students were awarded cheques: Loredana Ciobotaru and Gevorg Tovmasyan came first in Luxembourg at each of the final exam sittings and received a cheque of €250. Xavier Dunand, who was unable to join, will receive a cheque of €100.